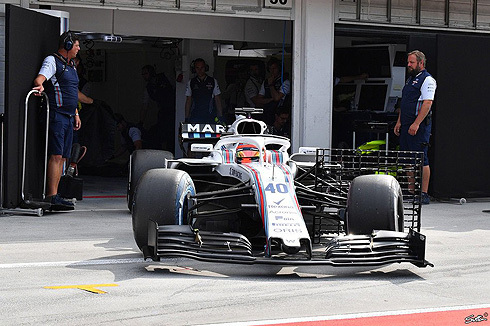 Day two of the Williams Martini teams Hungaroring test would see Robert Kubica take over from Oliver Rowland. Robert would work through a similar program testing the 2019 front wing in the morning and following that Robert would return to the 2018 front wing to continue testing aiming to work on the current issues. Overall the team came away happy with the results as the team now moves onto their summer break. 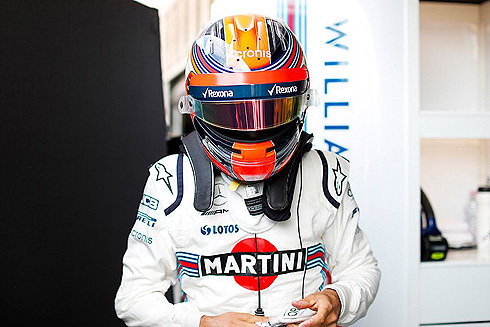 The second day of the Williams Martini teams Hungaroring test would see Robert Kubica take over from Oliver Rowland. As per usual there would be a crowd of Kubica supporters in the stands opposite the pits. 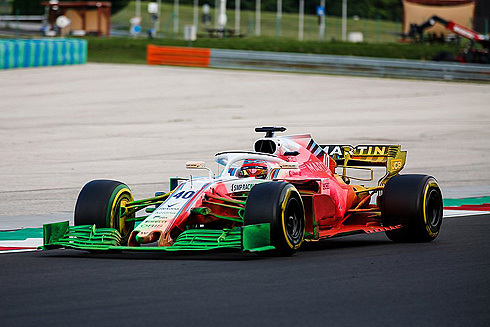 Robert would start the day off with aero testing running measuring devices attached to the chassis behind the left front wheel, a repeat of what Oliver Rowland did the day before. . At this time he was again running the 2019 design front wing. Robert would be running on the medium tyre as he lapped the circuit but he would not set a time. He would pit and after a lengthy delay would return and at this time started to set lap times. This would see Robert now running with the 2018 front wing and as the morning progressed Robert would set a best time of 1m:19.376 having completed twenty eight laps as the morning session drew to a close, running on the medium tyre. Robert was able to set a 1m:18.451 but this time he would be using the ultrasoft tyre. With the end of the morning running Robert had completed thirty eight laps. With the lunch break over the team would get Robert back out this time running on the soft tyre. He would pit seeing the track empty. An hour into the afternoon session Robert had now completed sixty six laps. 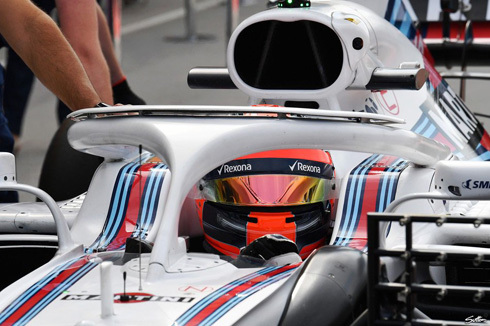 He would continue running pitting during the runs and would have completed eight two laps when he was forced to pit as a result of a red flagged. There was two hours remaining in the day and the session would restart. A short run would see Robert's total move up to eighty seven laps. He would venture back out late in the day for a further run and by the end of the day would complete one hundred and three laps. Rob Smedley, Head of Performance Engineering: We have ended what has been a successful test. We came here to predominately concentrate on 2019 aero specification and we have carried out every single item on the test programme regarding 2019 that we set out to, and some more. The engineering team and mechanics couldn’t have worked any harder and have done a great job. We need to go away now and use all the data to help us with correlation for 2019 regulations. Additionally, we had a look at the remainder of the season, some set up, some tyre preparation work and we have some interesting directions from there. Robert set some good lap times considering the tyres we gave him and the time in the car. Overall, it’s a good way to go into the summer break for the team. Robert Kubica, Reserve and Development Driver: It was a good day. We had a mixed programme with some data collection for next year and trying to understand our car better for 2018. We also ran a few runs with the current car specification to help with the rest of the season. We have a lot of data to go through and analyse but it was a good test to end on before the summer break.